Jefferson County Pet Food Pantry : JCAC Spring Open House/Vaccination Clinic 4/13/2019! 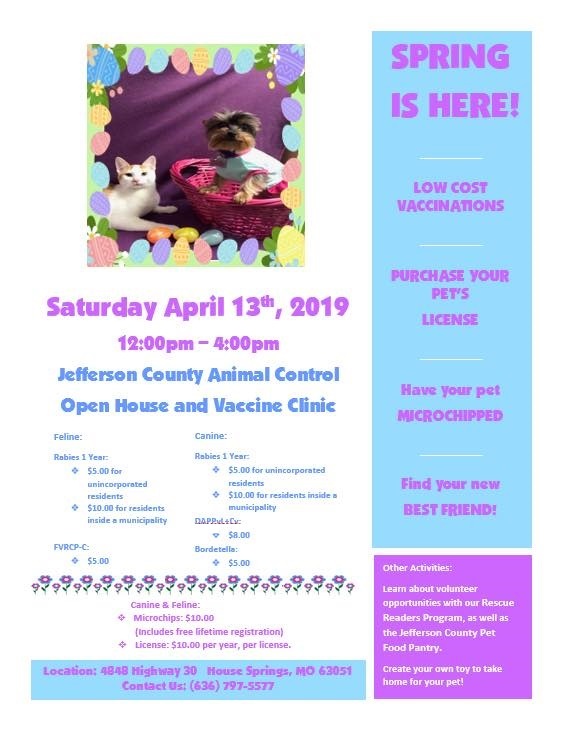 JCAC Spring Open House/Vaccination Clinic 4/13/2019! Rain or shine! This Saturday April 13th, 12-4 at Jefferson County Animal Control, Missouri Low Cost vaccination Clinic, Open House. Lowest prices around! This event is at the "future" facility, 4848 MO-30, Byrnes Mill, MO 63051 (formerly Hillside Presbyterian Church). We will have a booth set up, with low cost spay/neuter info and how to apply for free pet food. Come visit us, get your pets vaccinated, micro-chipped and your required county license at crazy low prices. It's always a lot of fun!